Seals diving for their dinner near Antarctica have surfaced with an extra morsel: information, gathered by electronic tags on the animals’ heads, about the shape of the seafloor there. The work has revealed previously unknown undersea channels, through which warm water might flow toward fragile ice shelves. And the seals do it all for a fraction of the cost of traditional seafloor mapping done from ships. “It gives you a much denser picture of what the water depth is than anything you can conceivably do with ship tracks,” says Laurence Padman, an oceanographer at Earth & Space Research in Corvallis, Ore., and a coauthor of an upcoming paper in Geophysical Research Letters describing the technique. Seals, walruses, whales and other large marine creatures have moonlighted as oceanographers before. Scientists typically glue sensors to the animals’ bodies that measures factors like temperature and salinity. Researchers have used this information to study water temperatures around Greenland, among other topics. But the new work is the first to extract information on the shape of the seafloor — known as bathymetry — from the sensors, which also measure pressure and hence depth. “You can actually map the ocean floor,” says team member Daniel Costa, a marine biologist at the University of California, Santa Cruz. 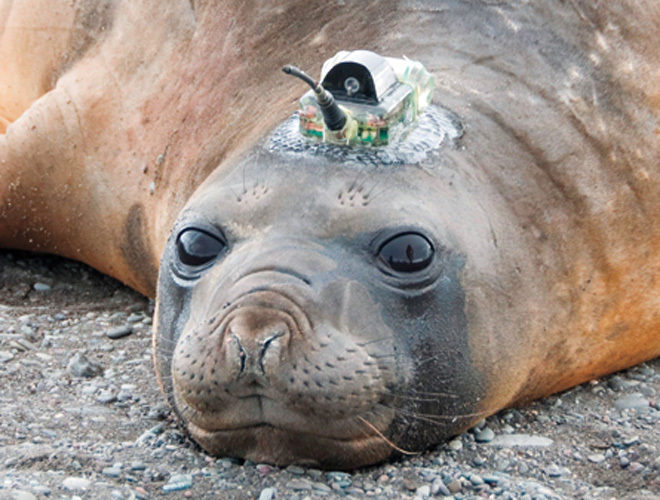 The data came from 57 elephant seals, tagged by Costa’s group over five summers at the U.S. Antarctic Marine Living Resources camp in the South Shetland Islands. As the animals swim, the tags record information every few seconds, then relay it via satellite once the seals surface. About 30 percent of the time seals dive all the way to the bottom to forage for food, says Padman, so by studying enough dives for each animal — some 200,000 dives in total — the researchers can deduce where the seafloor lies. “It’s a novel and useful technique for gathering bathymetry data,” comments Paul Holland, an ocean modeler at the British Antarctic Survey in Cambridge, England. Within the seal data Padman’s team discovered several significant troughs cutting across the continental slope off the west side of the Antarctic Peninsula. These features hadn’t been mapped before, says Padman, yet they play an important role in ocean circulation. Warm water can flow through such channels and up under the floating ice shelves that extend off Antarctica, such as the Wilkins ice shelf that partially disintegrated in 2008. Better information on underwater topography could lead to improved models of how the ocean will respond to climate change, says Padman. Other researchers might now be inspired to dig through seal data to see what features could be mapped, he adds. Ships can cost tens of thousands of dollars a day to operate in Antarctic waters, whereas there is a wealth of readily available information available on seal tags. “We want to encourage other people who work with seal data to look into it,” says Padman. Scientists from the MARUM Center for Marine Environmental Sciences and the Max Planck Institute for Marine Microbiology in Bremen on board the German research vessel Meteor have discovered a new hydrothermal vent 500 kilometres south-west of the Azores. The vent with chimneys as high as one meter and fluids with temperatures up to 300 degrees Celsius was found at one thousand metres water depth in the middle of the Atlantic Ocean. The discovery of the new deep-sea vent is remarkable because the area in which it was found has been intensively studied during previous research cruises. The MARUM and Max Planck researchers describe their discovery in their video blog. The Bremen scientists were able to find the hydrothermal vent by using the new, latest-generation multibeam echosounder on board the research vessel Meteor that allows the imaging of the water column above the ocean floor with previously unattained precision. The scientists saw a plume of gas bubbles in the water column at a site about 5 kilometers away from the known large vent field Menez Gwen that they were working on. A dive with the remote-controlled submarine MARUM-QUEST revealed the new hydrothermal site with smokers and animals typically found at vents on the Mid-Atlantic Ridge. Since the discovery of the new vent, the scientists have been intensively searching the water column with the multibeam echosounder. To their astonishment, they have already found at least five other sites with gas plumes. Some even lie outside the volcanically active spreading zone in areas where hydrothermal activity was previously not assumed to occur. "Our results indicate that many more of these small active sites exist along the Mid-Atlantic Ridge than previously assumed," said Dr. Nicole Dubilier, the chief scientist of the expedition. "This could change our understanding of the contribution of hydrothermal activity to the thermal budget of the oceans. Our discovery is also exciting because it could provide the answer to a long standing mystery: we do not know how animals travel between the large hydrothermal vents, which are often separated by hundreds to thousands of kilometres from each other. They may be using these smaller sites as stepping stones for their dispersal." Research on deep-sea hydrothermal vents in the Atlantic is the objective of the 30 marine scientists from Hamburg, Bremen, Kiel, Portugal, and France who have been on board the German research vessel Meteor since September 6th. The expedition to the submarine volcano Menez Gwen near the Azores is financed by MARUM, the Center for Marine Environmental Sciences in Bremen. "One of the questions that the team would like to answer is why the hydrothermal sources in this area emit so much methane -- a very potent greenhouse gas," says chief scientist Nicole Dubilier, who is also a member of the Steering Committee of the Census of Marine Life Vents and Seeps project ChEss (Chemosynthetic Ecosystem Science). "Another important focus of the research is the deep-sea mussels that live at the hydrothermal vents and host symbiotic bacteria in their gills. The mussels obtain their nutrition from these bacteria." Video blog: "News from the main deck"
An expedition on a research vessel is not only marked by great moments, like this discovery; everyday life on the Meteor is also filled with other exciting activities and events. Work on a research vessel goes on round the clock throughout the entire expedition. In his video podcast "Neues vom Peildeck / News from the observation deck," available through the Hamburg-based newspaper Abendblatt, and in German and English on YouTube, Dennis Fink, a doctoral student at the Max Planck Institute for Marine Microbiology, reports on the activities of the ship's remote-operated vehicle (ROV) MARUM-QUEST, the various instruments used by the scientists and life on board the ship. In the two-minute video blogs, Fink and his colleagues show fascinating images direct from the sea floor. An ancient shipwreck was found off the coast of Cyprus. Diver Anastasia Stathara from Greece, a volunteer member of the archaeology team, swims among the cargo amphoras of the wreck. The examination of a Mediterranean shipwreck from the 4th century B.C. could shed light on ancient sea routes and trade, researchers say. The remains of a merchant vessel, full of amphoras that probably had been filled with wine, were discovered in 2006 on the seafloor south of the island of Cyprus. A team has been excavating the site, diving and dredging up important pieces, since then. The wreck was first discovered in 2006 by fishermen. One of the ship's anchors was also uncovered. The particularly well-preserved remains, especially the amphoras, which were oval, narrow-necked vases, reveal many clues about the ship's story, the research team says in a new paper. "We know by having studied a lot of these ceramic containers — we have created catalogs with different shapes — we know where they come from and where they date," said Stella Demesticha, a professor of maritime archaeology at the University of Cyprus, who is leading the shipwreck research team. The amphoras found at this site, she said, are very typical of those made on the Greek island of Chios in the Aegean Sea. "We know the red wine from Chios was praised," Demesticha told LiveScience. "It was very good quality, very expensive." A large collection of olive pits was also discovered at the shipwreck site. The scientists don't know whether the olives were packed as a source of food for sailors or were a commodity to be sold. The archaeologists aren't sure what caused the vessel to sink, but said the fact that it was found pretty far offshore suggests it was probably downed by a storm or a fire. "There's a lot to learn from this wreck," Demesticha said. "We know that wine commerce was flourishing in antiquity. But because we haven't excavated many shipwrecks, we don't know many details about how exactly this was happening." For example, she said, researchers would like to know how cargo was stowed on ships, as well as how trade deals were brokered and how many transactions took place, particularly between people from the Aegean (between Greece and Turkey) and the rest of the Mediterranean, including Cyprus. "By studying the cargo of the ship, we're going to find more details about contacts between the two areas in that period," Demesticha said. The findings so far are detailed in a paper in the December 2010 issue of the International Journal of Nautical Archaeology. Scientists in the United States have discovered the secret of the narwhal's long tusk, which they say is something unique in the animal world. Researchers working in Canadian Arctic with the sea mammal say the tusk is actually a sensory probe delivering information to the animal in a distinctive way. The narwhal's tusk, a 1.5-metre-long tooth emerging from the left side of the upper jaw, has long been a source of fascination. Its spiral nature led to it being marketed for princely sums in medieval Europe as a unicorn's horn. In the past the tusk has been judged a weapon, a mating display and a fishing spear. It turns out, the truth is stranger than the fiction. Scientists studying the animal in Canada's Arctic have found that more than 10 million tiny nerve connections tunnel their way from the tusk's core to its outer surface. These give the tusk an extremely sensitive surface, capable of detecting changes in water temperature, pressure and particle gradients, scientists say. It also allows the whales to detect water particles characteristic of the fish that constitute their diet. And when Narwhals display "tusking" behaviour, or rub tusks, they're likely experiencing a unique sensation, say scientists. The researchers say there is no other animal with a comparable ability in nature, and certainly no comparable tooth with that kind of functional adaptation. "Now that we know the sensory capabilities of the tusk, we can design new experiments to describe some of the unique and unexplained behaviours of this elusive and extraordinary whale," said Martin Nweeia of the Harvard School of Dental Medicine in Boston. The research into the nature and function of the narwhal's tooth may also lead dental researchers to develop better materials for tooth restoration in humans, says Nweeia. The research was partly funded by the federal Department of Fisheries and Oceans. The findings were presented Tuesday at the Conference on the Biology of Marine Mammals in San Diego. A new map developed by Duke University researchers, in partnership with the Census of Marine Life and National Geographic Maps, provides the most detailed overview yet of life in the world’s oceans. The two-sided, poster-sized map, is based on 10 years of data from the international Census of Marine Life and other scholarly sources. It is being publicly presented for the first time, along with other documents and findings from the census, at a news conference today (October 4) in London, U.K., at the Royal Institution of Great Britain. The map took more than two years to plan, develop and design, and includes new data previously not available in any one document, says Patrick Halpin, associate professor of marine geospatial ecology at Duke’s Nicholas School of the Environment. “The value of this map is that lets us see patterns of species diversity and migration in a new light, and provides a clearer picture of biological abundance, which is very hard to measure,” he says. The hope, he says, is that the map will attract greater public attention to the census and its discoveries. Among other things, the map identifies the regions that are home to the world’s greatest concentrations of marine biodiversity and abundance; the long-distance migration paths of key predators; the regions that have experienced the greatest impacts from human activities; and the locations of coral reefs, hydrothermal vents, seeps, seamounts and other geological features that act as “islands of high diversity and abundance,” says Halpin, whose team at Duke’s Marine Geospatial Ecology Laboratory created the document with input from census leaders. Each side of the color-coded map illustrates a different set of related topics or themes. On the side titled “Diversity, Distribution, Abundance,” the main image tracks the long-distance migrations of 11 taxonomic groups of ecologically important predators, including sharks, sea turtles, seabirds and tuna. A smaller panel maps vertical movement in the water column — how fish and zooplankton migrate up and down, from sunlit surface waters to the murky depths, in response to changing diurnal and seasonal stimuli. 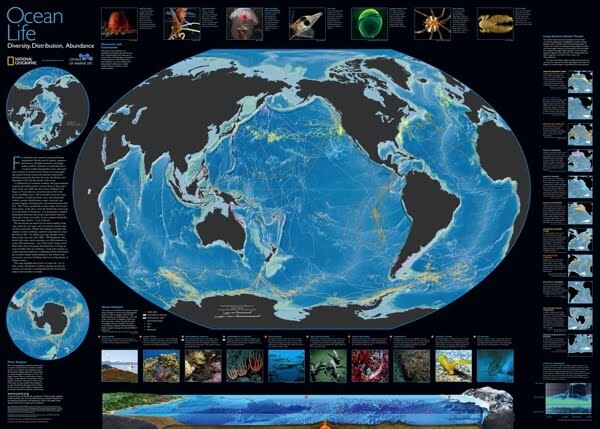 On the side of the map titled “Past, Present and Future,” the main image shows which regions of the world’s oceans are home to the greatest biodiversity of species, and which have experienced the greatest human impacts. Marine hot spots appear around the Philippines, Japan, China, Indonesia, Australia, India and Sri Lanka, South Africa, the Caribbean and the Gulf of Mexico. Biodiversity and high human impacts collide in coastal areas such as the Western Pacific and North Atlantic. A smaller map charts the abundance of seafloor life of the world’s oceans – the quantity of animals, measured as biomass, found in each region regardless of the number of species. “While the greatest biodiversity is found in the warm waters of the tropics, the greatest abundance of life appears in high latitudes in the polar regions,” Halpin says. Halpin and his team, Nicholas School research associates Jesse Cleary and Ben Donnelly, used geographical information systems technology to bring together key findings from the wealth of census and related data archived at the Ocean Biogeographic Information System, the world’s largest, publicly accessible marine species database. With more than 2,700 census contributors and thousands of related publications to draw from, they had to make tough choices. “Ninety-nine percent of the data from the census isn’t here, but the key themes – that life in Earth’s oceans is richer, more connected and more altered than expected – are represented,” Halpin says. Most of the data included on the new map would have been impossible to document 10 or 15 years ago, he explains. Recent advances in satellite telemetry tracking devices, sonar, underwater cameras and microphones, autonomous reef monitoring structures, DNA barcoding to identify species, and other technologies have made it possible. The Census of Marine Life is a network of researchers in more than 80 nations who engaged in a 10-year scientific initiative to assess and explain the diversity, distribution and abundance of life in the oceans. Halpin, Cleary and Donnelly are part of the Census’ Mapping and Visualization Team. They will join other project contributors at the October 4 news conference in London, and on October 5 will make a more detailed presentation about the map at a symposium at the Royal Society in London. Principal funding for the mapping project came from the Alfred P. Sloan Foundation. People often credit their ideas to individual "Eureka!" moments. But Steven Johnson shows how history tells a different story about the natural history of innovation. His fascinating tour takes us from the "liquid networks" of London's coffee houses to Charles Darwin's long, slow hunch to today's high-velocity web and GPS birth. 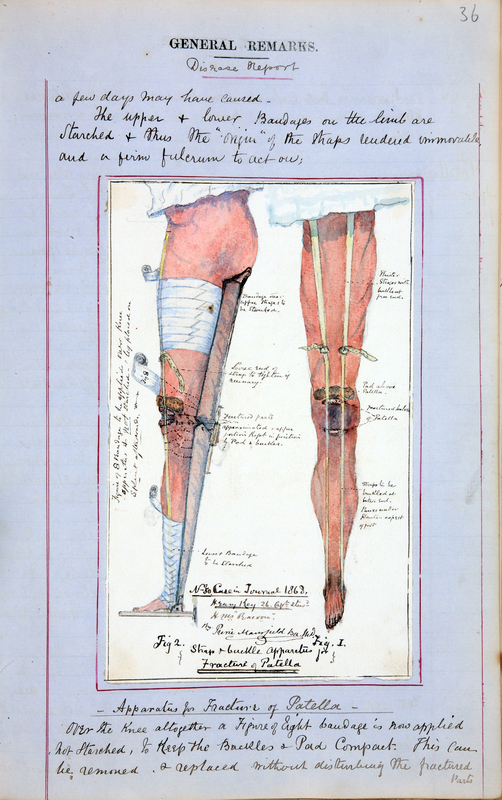 (page from the Medical and surgical Journal of HMS Racoon by Dr Pierce Mansfield. From a young girl who vomited a giant worm to lightning strikes and walrus attacks, the treacherous nature of life at sea in the 19th century was laid bare Thursday in newly released British archives. Bruno Pappalardo, naval records specialist at the National Archives in London, said the handwritten notes, dating from 1793 to 1880, were an important source of medical history. "The journals are probably the most significant collection of records for the study of health and medicine at sea for the 19th century," he said. More than 1,000 Royal Navy medical officer journals were made public for the first time by the National Archives, revealing a world where drunken debauchery was a common theme of ship life, but rum was also used as a medical cure-all. One of the most startling accounts reveals the case of 12-year-old Ellen McCarthy, a passenger on an 1825 journey from Ireland to Canada who complained of pain in her belly, constipation, a quick pulse and a great thirst. She subsequently vomited up an 2.2-meter worm, and later had another “motion”, producing two shorter worms. The collection of surgeons’ logs reveal elsewhere how three men were killed when the ship Arab, on its way to the West Indies in 1799-80, was hit by lightning at sea. Another ship, this one bound on a voyage of discovery to the Arctic in 1824, was attacked by several walruses, which had to be beaten off with bayonets. The account of the Arab also describes a man stung by a scorpion or centipede and another bitten by a tarantula. In both cases the surgeon turned to rum, which he claimed was effective if applied early. Tobacco smoke was also used as an experimental treatment on a man who fell overboard from the Princess Royal which serviced the Channel in 1801-02, and appeared to be dead by the time he was pulled aboard. After smoke was pumped into his lungs for almost an hour, a pulse was detected and he recovered. The treatment was hailed a success, although in the next journal, he was hospitalised suffering from pneumonia. The dangers of sea life did not only affect those on board, however. The medical journal of surgeon Godfrey Goodman of the Dido in 1875 expressed concern that his ship had spread a measles epidemic to Fiji, which eventually killed one-third of the population.